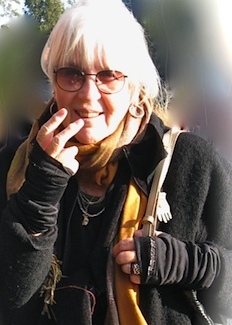 If you've heard of Joanne Kyger and know her poetry, you're either: 1) a Buddhist with serious literary inclinations; 2) an ecologist with ditto; 3) an historian of literary Northern California; 4) a Beat Generation aficionado; or 5) a nimble self-directed reader. Because her work -- all 30 books and chapbooks -- is one of the most durable, if largely unacknowledged, contributions to "modern" American poetry. 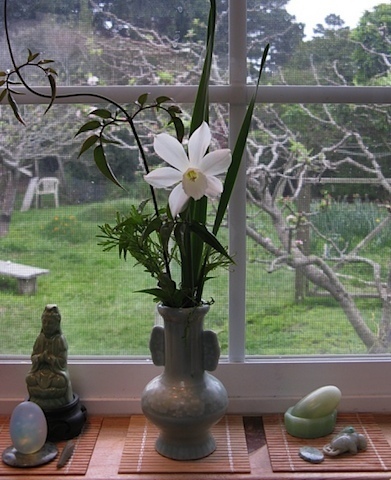 For more than five decades, Kyger has lived a humble life on the coastal mesa of Bolinas, California, diligently building an oeuvre that has slipped right through of the hands of the literary establishment. 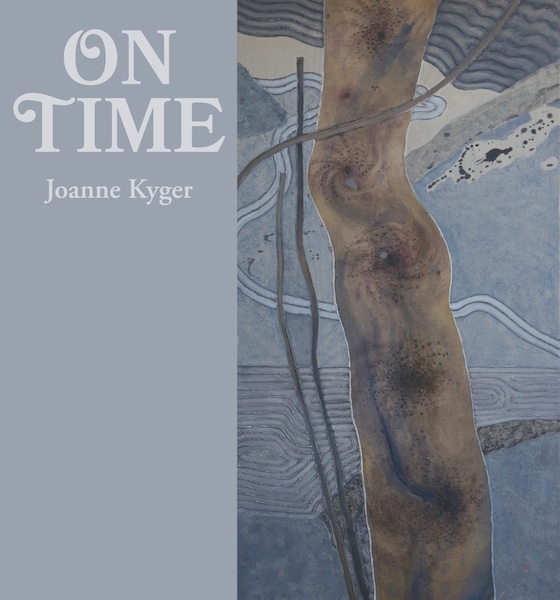 On Time: Poems 2005 - 2014 (Citylights 2015) is the latest link to the chain. The reasons why Kyger has yet to be widely recognized for her immense achievement are readily understood. From the moment she stood beside them in the 1960s, husband Gary Snyder and close friend Allen Ginsberg have cast very long, opaque shadows. Just as importantly, Kyger has never tooted her own horn, never positioned herself in the residency/workshop/award circuit, let alone held a coveted post in an MFA program. She's excluded from anthologies because she links to various poetry "schools" -- Beat, San Francisco Renaissance, ecopoetics, postmodern -- without being a card-carrying member of any of them. And most importantly, her poetry is deceptively simple: lines might seem, at first, tossed-off when in fact they're precisely chiseled. All too often, taste-makers focus on obvious disruptors without acknowledging quiet revolutions taking place. Throughout On Time, Kyger steadily delivers the poetic idiom that's uniquely hers -- a surprising mix of journal, gossip sheet, topical commentary, dharma workbook and phenomenological primer. She has a knack for weaving in voices, whether they speak across the dinner table ("Stop fidgeting!") or across the centuries ("Nobody Told Me Grief Felt So Much Like Fear," C. S. Lewis). Her eagle-eyed observations on the Bolinas ecosystem are a staple ("watching / the great Blue / Heron strike a gopher in its hole"), along with her humor ("open wide / say / AH!"). In earlier books, Kyger might take herself or the reader to task for lapses of attention, but at 81-years-old, she has earned the Big Picture view and more often the wisdom to just let things be. Sketching the plenitude of the present -- whether it's grief at the loss of a friend or curiosity about a circle of men eating asparagus -- is central to Kyger's lifelong work. In deference to this impossible task, she dates almost everything -- either incorporating the composition date in the poem's title or appending it as an italicized note at its close. The seasons, the hours of the day, syllables and even her breath are apt to enter into the accounting of the moment, and complement attention to her location and setting. Together, the consistent marking of time and place emphasize how deeply experiential the poems are. "You're in the moment," she writes. "So sorry it will never be / like this again --." And here is the crux of the matter: Kyger resists "letting go" of experience with all her might at the same time that her Buddhist training and practice counsel detachment. What is at stake in the poems is more than the plums she's eating, or a dream in which Gary Snyder appears: it's a vigilant exploration of the nature of consciousness in which the particulars of experience -- light filtering through the clouds, a neighbor's note, surfers waiting for waves -- bridge the gap between inner and other worlds. Across six decades of writing, these careful attentions to consecutive moments collectively constitute a massive humanist document, of which On Time is the latest installment. Reading Kyger is not like reading about a life so much as perceiving what it's like to really live.